Aguascalientes (Spanish pronunciation: [ˌaɣwaskaˈljentes] ( listen)) is the capital of the state of Aguascalientes and is its most populous city, with a metropolitan population of 1,000,000. It is located in North-Central Mexico. It is part of the macroregion of Bajío, which is among the safest and most prosperous regions in Mexico. It was part of the kingdom of Nueva Galicia(along with the states of Jalisco, Zacatecas, Guanajuato, Nayarit and a part of Michoacán), during the independence was part of Zacatecas in 1835 it became the capital of the Free and Sovereign State of Aguascalientes. Aguascalientes has been called the cleanest city in Latin America. Aguascalientes is experiencing an ongoing social, economic, and aesthetic revitalization process. 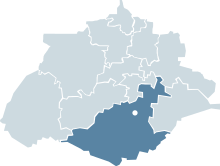 Aguascalientes has a population which includes Japanese, Koreans, and Germans. It stands on the banks of the Aguascalientes river, 1880 meters above sea level, at 21°51′N 102°18′W﻿ / ﻿21.850°N 102.300°W﻿ / 21.850; -102.300. It is the municipal seat for the Aguascalientes Municipality. The Aguascalientes metropolitan area includes the municipality of Jesús María and San Francisco de los Romo. It was a Chichimeca Indian territory. It later blossomed as a strategic link between Mexico City and the mines of Zacatecas, while prosperous agriculture and ranching helped feed Spain's emerging New World cities. OECD has recognized Aguascalientes as having a good business climate. It is a strong business and economic center in the Bajío region. Its strategic location and infrastructure have made it a regional hub and a location for international headquarters. Also home to two of Nissan's largest and most important manufacturing plants in Latin America. Other important companies located in Aguascalientes include Jatco, Coca-Cola, Flextronics, Texas Instruments, Donaldson, and Calsonic Kansei. Because of its services and hotel industry, Aguascalientes is one of the most important centers in Mexico for entertainment, gastronomy, leisure activities, arts and recreation. The second neighborhood is the Barrio de San Marcos, which has its roots in the early 17th century as an indigenous settlement on the outskirts of the then-village of Aguascalientes. Between 1628 and 1688, some communal land was allocated to the community, but the indigenous people still worked on Spanish-owned farms and produced goods to sell in Aguascalientes. Meanwhile, they organized the construction of a simple hospital and a chapel. This original chapel was replaced by the current Templo de San Marcos completed on December 15, 1763; this church is the spiritual headquarters of the Feria Nacional de San Marcos. Aguascalientes today identifies itself as at the confluence of tradition and industry. Its preserved colonial downtown testifies to its rich architectural heritage and cultural vision. On the other hand, the precisely planned peripheral expressways, as well as its first class avenues and lanes, are surrounded with industrial parks that employ thousands of people. The state reports a high index of migrants, especially from other states, seeking to acquire a better quality of life. 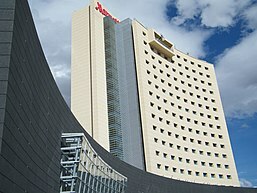 The Aguascalientes Marriott Hotel is located in the most important zone of the city. Texas Instruments has one plant in Aguascalientes, it is dedicated to integrated circuitry (IC) manufacturing. Sensata Technologies, has one plant in the city, making sensors and controls for automotive, HVAC and industrial use. Flextronics is another electronics manufacturer that has a plant located in Aguascalientes City. There are also several companies that work in the robotics industry, the most notable being FANUC Robotics. Aguascalientes houses the largest festival held in Mexico, the San Marcos Fair, which takes place from the middle of April to the beginning of May. The celebration was held originally in the San Marcos church, neighborhood, and its magnificent neoclassical garden; since then, it has greatly expanded to cover a huge area of exposition spaces, bullrings, nightclubs, theaters, performance stages, theme parks, hotels, convention centers, and other attractions. It attracts almost 7 million visitors to Aguascalientes every year. The city of Aguascalientes is made up of four traditional neighborhoods, all of which grew up around the central Plaza de la Patria: Guadalupe, San Marcos, El Encino and La Estación. In El Encino or La Triana, head for the Encino gardens with their tile-decorated central fountain is full of tranquility. While in the area, the José Guadalupe Posada Museum – showcasing the work of an extraordinary cartoonist and engraver born in Aguascalientes – is well worth a visit. The museum houses two permanent exhibition rooms and another for temporary exhibitions. Last but not least, the neighborhood of La Estación takes its name from the old railway station, inaugurated in 1911 and one of Aguascalientes' architectural and historical treasures. Other designs by Refugio Reyes include the Paris Hotel, the Francia Hotel, and his masterpiece, the Church of San Antonio. The Church of our Lady of Guadalupe possesses an extraordinarily exuberant Baroque facade designed by José de Alcíbar, a renowned architect of the period considered to be one of the most famous artists in Mexico in the 1770s. 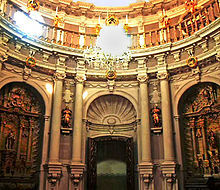 The Camarin of the Immaculate in the church of San Diego is considered by historians to be the last Baroque building in the world; it links the Baroque and Neoclassical styles; it is the largest of the fewer than ten of these type of structures built in the whole continent. Metroaguascalientes was one of the radio stations for the city of Aguascalientes. Wendolly Esparza, American-born Mexican television personality best known for winning Miss Mexico 2014 and placing top 15 in Miss Universe 2015. Panteras de Aguascalientes its part of the Mexican basketball league National Professional Basketball League (LNBP). In 2003, the Panteras won the championship of the LNBP. The Panteras play their home games at the Gimnasio Hermanos Carreón. ^ Javier Rodríguez Lozano. "En estos días Aguascalientes llegará al millón de habitantes - La Jornada Aguascalientes (LJA.mx)". La Jornada Aguascalientes (LJA.mx). Retrieved 7 September 2014. ^ "Bajío, el nuevo milagro mexicano - T21". T21. Retrieved 7 September 2014. ^ "Historia de la Ciudad de Aguascalientes". Ags.itesm.mx. Archived from the original on October 21, 2013. Retrieved 7 September 2014. ^ "Aguascalientes, la ciudad más limpia de Latinoamérica". El Informador. Retrieved 7 September 2014. ^ "Línea Verde contará con servicios digitales". La Jornada Aguascalientes. Retrieved 7 September 2014. ^ "Aguascalientes, traditional city in Mexico". Visitmexico.com. Retrieved 7 September 2014. ^ a b "Se ofertan mil empleos a jóvenes en Aguascalientes". Desdelared.com.mx. Retrieved 7 September 2014. ^ "Aguascalientes recibió a 187 mil turistas este verano". Desdelared.com.mx. Retrieved 7 September 2014. ^ Díaz Márquez, Ilse. "Fundación de Aguascalientes". Gobierno del Estado de Aguascalientes. Archived from the original on March 11, 2016. Retrieved February 23, 2016. ^ "Barrio del Encino (Barrio de Triana)". Gobierno del Estado de Aguascalientes. Retrieved 23 February 2016. ^ Dobrowolski, Jim (February 2, 2017). "The Four Historical Neighborhoods of Aguascalientes". Spanish Learner Central. Retrieved 23 February 2016. ^ "Barrios de Aguascalientes, México | VisitMexico". www.visitmexico.com. Archived from the original on 2016-03-04. Retrieved 2016-02-24. ^ "Barrio de la Estación". Gobierno del Estado de Aguascalientes. Retrieved 24 February 2016. ^ NORMALES CLIMATOLÓGICAS 1951-2010 Archived 2013-12-24 at the Wayback Machine (in Spanish). National Meteorological Service of Mexico. Retrieved August 30, 2012. ^ "Normales climatológicas para Aguascalientes, AGS" (in Spanish). Colegio de Postgraduados. Archived from the original on February 19, 2013. Retrieved January 5, 2013. ^ "Número de habitantes. Aguascalientes". cuentame.inegi.org.mx. Retrieved 2016-02-23. ^ INEGI, CONAPO, SEDESOL (2000). Instituto Nacional de Estadística y Geografía (ed. ): «Ciudades de México por IDH» (PDF). ^ Ltd., NISSAN MOTOR Co.,. "NISSAN | NISSAN INAUGURATES ALL-NEW AGUASCALIENTES, MEXICO PLANT, BUILDING ON A REPUTATION FOR QUALITY AND EFFICIENCY". www.nissan-global.com. Archived from the original on 2015-10-26. Retrieved 2016-02-23. ^ "Home Archived October 3, 2016, at the Wayback Machine." Escuela Japonesa de Aguascalientes. Retrieved on May 10, 2014. "Avenida del Lago 161,Jardines del Parque,Aguascalientes, AGS,C.P.20276,Mexico"
^ "Visita a la Escuela Japonesa de Aguascalientes" (Archive). La Jornada Aguascalientes. Retrieved on October 1, 2013. ^ "Se implementará en Aguascalientes el proyecto de Movilidad en Bicicleta del DF - La Jornada Aguascalientes (LJA.mx)". La Jornada Aguascalientes (LJA.mx). Retrieved 7 September 2014. ^ Zapato Cabral, Jose Antonio (February 9, 2007). "Noticias_locales_del_09_de_febrero_de_2007". noticiero (in Spanish). METROAguascalientes. Retrieved February 2, 2019. Wikimedia Commons has media related to Aguascalientes City. Wikivoyage has a travel guide for Aguascalientes.